As human beings, storytelling is inherent to our way of life. It is a phenomenon that has not only bonded us from generation to generation—dating back to cave paintings—but one that unites us across cultures. That being said, the way we tell stories certainly evolves as technology does. Last week, we talked about social media stories—what they are, and why they’re becoming important for marketers. 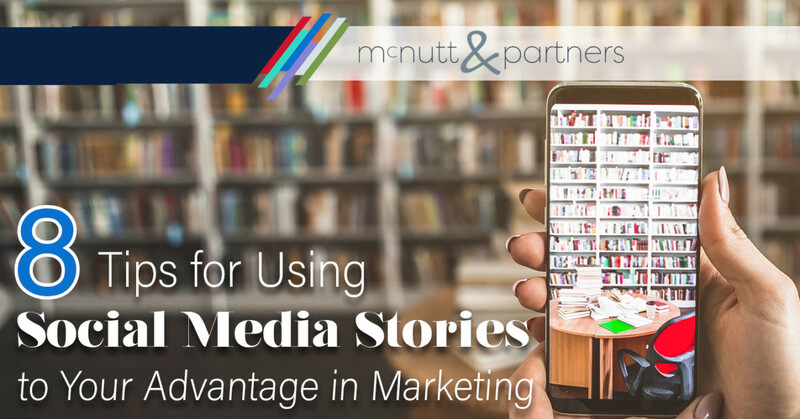 With the basics laid out, now we’ll look at a few ways that you can use social media stories to your advantage in marketing. As a quick recap, stories are available on Instagram, Facebook, Snapchat and a handful of other popular platforms. When you post an image or video to your “story,” it stays there for 24 hours from the time it was posted. The idea is to post several images or videos to your story in succession to, well, create a story. With consumers becoming increasingly story-obsessed, it’s a trend that marketers should jump on in 2019. Think you are ready to start using stories for your business pages? Here are a few tips that can help get you started. Try the most popular platform first. Instagram is currently the most popular platform for social media stories; thus, it would be a good place to start for the first-time story creator. Instagram users tend to interact with Instagram stories far more than Facebook users interact with Facebook stories—at least right now anyway. Instagram also offers various features for stories, like the ability to post GIFs, and the Story Highlights feature, which gives users the opportunity to make their stories permanent. That being said, know your audience. If your clientele is older, it may be more active on Facebook; if it is younger, it tends to be more active on Instagram. Use the creative tools that Stories offers. From geofilters on Snapchat to Boomerang on Instagram, stories offer users a selection of exciting tools to make their posts more interesting and engaging. On Instagram specifically, users can adjust font type, placement and size, add music, ask questions and even make polls. Play around with your options to create stimulating content. Incorporate links where you can. Adding a link is a great way for using social media stories to your advantage in marketing, but it has its limitations. Currently, Facebook does not allow links in its stories, and Instagram only allows links if you have 10,000 or more followers. If that’s the case, users will swipe up to see a link that you added to an Instagram story. If you don’t have 10,000 or more followers (which most small businesses do not), you can still add links to your Snapchat stories. Simply click the paperclip icon when creating a Snap and add your link. Then, the paperclip will appear on the Snap to indicate to viewers that there is an associated link. Clicking the paperclip will take them to the link. Mention others. Everyone enjoys a shout out, and social media stories are no different. You can add mentions for other brands and/or your followers on Instagram stories. This mention will give that user a notification indicating that he or she has been tagged. The idea is the same as tagging another user or business page in any social media post—in the hope that you will get a shout out back and therefore exposure to more followers. Try live video. Authenticity is the name of the game, and there’s nothing more authentic than live video. Going live on your story allows users to interact with you (like and comment) in real time. If you opt to go live, keep in mind that it will require you to actively interact with the people watching you—which is the end goal, after all. Include a call-to-action. Whether you want people on your Instagram to view a post on your Facebook or vice-versa, or you want followers to check out your latest blog post on your website—your story for marketing purposes should include a call to action. Use the text tools to urge viewers to visit your site, social pages, blog—whatever it is that you would like for them to do. Share content across platforms. Anything you post to a story can be exported to your camera roll or downloads, which makes it available for you to post on any of your social media platforms. For example, if you post a graphic or video to your Instagram story that you find particularly engaging, save it and share it on your Facebook feed as well. Show your human side. The point of using social media stories to your advantage in marketing is to make a connection with your brand followers. Customers like to see the “human” side of businesses—the faces behind the logo. Use your stories to solicit emotion—to answer questions, provide entertainment or offer something of value. Doing so will incentivize your followers to continue watching. The social media stories format is a fresh way to present content to your social followers while allowing you to bypass the limitations of Facebook and Instagram’s news feed algorithms. Need help implementing stories into your marketing strategy? Contact us today at 334-521-1010, or visit our contact page.